Just recently we had the distinct pleasure of presenting three more of our employees with their 10-Year Anniversary awards. 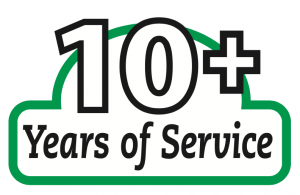 We now have just over half of our team that has now hit the 10-year service mark with our company. Moreover, most of our other staff members have been with us for at least five years. This is a remarkable accomplishment for a company in the home improvement industry. In the first place, many home improvement “companies” don’t really have employees. They rely 100% on day laborers or subcontractors to provide work on an “as needed” basis. That may be a way to cut their overhead costs, but is not a good way to build a team or ensure the quality of the work performed. Remember: You get what you pay for. Other remodeling contractors hire workers seasonally, with layoffs during slow periods. (In our 23 years in business we have never laid anyone off – ever!) In our view that would compromise the effectiveness of our work team which is a concept in which we have no interest. This also brings into question whether a company is responsible for a worker’s actions. Lastly, a company that does not show loyalty to its workers can expect no loyalty in return. This is why the longevity of our employees matters so much to us. The experience of the people working on your home improvement project is directly related to making your experience a positive one. While our industry has a poor track record in retaining skilled and talented workers, our team roster proves that excessive turnover is not the case at Twin Cities Siding Professionals. We have made a very deliberate decision as a company to make certain that the people we have on staff – the people whom you invite to work on your home – have the necessary experience to do the job right. We also invest heavily in ongoing training so that our people can hone their skills, learn the latest “best practices,” and be familiar with the new materials coming into the market. We are always looking for ways to do a better job for you. So please join us in congratulating our three newest “10-Year” team members (Brent, Chad and Nate). They are the trustworthy, talented, and highly competent professionals who are going to make your home look and perform its best. If you think real know-how matters and you want a true professional working on your home’s siding and window replacement project, please give us a call at (651) 255-2844. We’d love the opportunity to put our experience to work for you!